Here's an item that isn't very old, compared to most of the ephemera I post. But it seems so antiquated, compared to the world we live in today, that it's kind of jarring. It certainly made me feel old. America Online's heyday was two decades ago, folks! 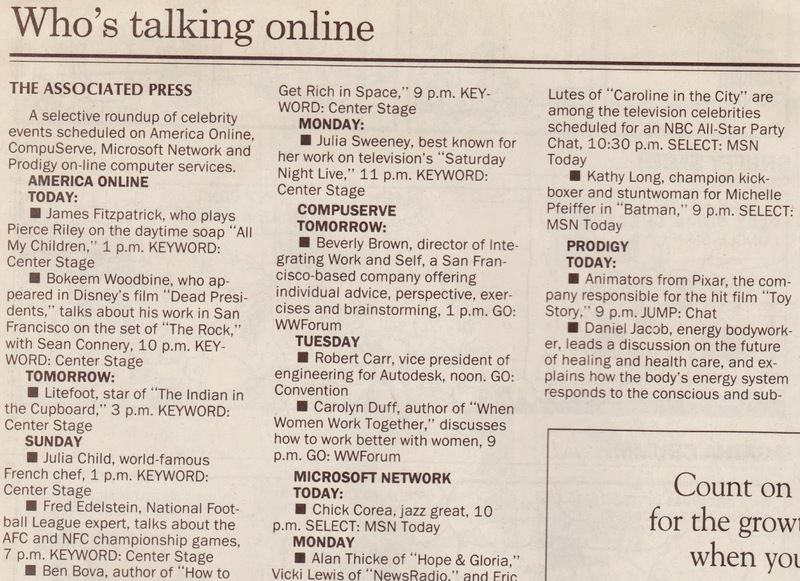 In this newspaper clipping from January 12, 1996, we see that The York Dispatch (and The Associated Press) were on the cutting edge in giving younger, technology-oriented readers content that might interest them.1 The AP provided, and the Dispatch published, a regular "roundup of celebrity events scheduled on America Online, CompuServe, Microsoft Network and Prodigy on-line computer services." Remember Keywords2 and Center Stage? They were the center of the online experience for most people who had a computer and managed [sarcasm alert] to find one of those elusive AOL sign-up CDs. Gary Paul Davis, aka Litefoot, talked about The Indian in the Cupboard movie on AOL. Robert Carr, vice president of engineering for Autodesk (maker of AutoCAD), chatted on CompuServe. Animators who worked on Pixar's Toy Story chatted on Prodigy. Morton Downey Jr., described as a "former talk show host whose acerbic style made him a household name," talked with Prodigy members. Nowadays, celebrities of this nature might opt to do an AMA on Reddit.3 And, 20 years from now, I'm sure some of you will be aghast at how antiquated AMAs are. According to the TV listings, ABC's TGIF lineup on January 12, 1996, featured Family Matters, Boy Meets World, Step by Step, and Hangin' with Mr. Cooper. 3. President Barack Obama has done an AMA on Reddit. And Bill Murray did a recent one that generated a lot of buzz.